Spatial sound, 3D, and object based are terms that could warrant status as least annoying technology buzzwords—they’re just too cool conceptually and experientially, commanding attention from everyday audio lovers and brilliant engineers alike. As such, the latest innovative solution dropping jaws of discerning listeners in this arena comes from the same research institution that transformed the way we listen to music with the MP3: Germany’s Fraunhofer Institute for Digital Media Technology (IDMT). The solution consists of the SARA Premium 3D Audio Engine, plus software modules for live production, acoustics, etc. that work with any DAW. A web-based interface enables use on any computer, touchscreen, Android, or iOS-based device. Another key differentiator is that ASA comes as a standalone product, compatible with any loudspeakers, amps, cables, etc. The solution consists of the SARA Premium 3D Audio Engine, plus software modules for live production, acoustics, etc. that work with any DAW. A web-based interface enables use on any computer, touchscreen, Android, or iOS-based device. 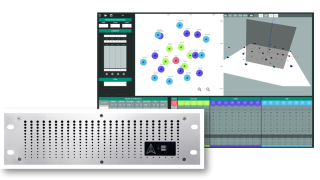 Fraunhofer released ASA in January of this year, and HoughtonLloyd first showed the solution in very limited sittings at NAB, then InfoComm. The AES show in Los Angeles marks a more formal coming out party, appearing with Alcons Audio in demonstration room 511C, September 29-October 1. Masque Sound of New Jersey signed on as the first authorized dealer in the U.S., paving the way for implementations in Broadway theaters. In Europe, the Zurich Opera House has already installed an ASA system. Other applications that are being targeted include theaters, planetariums, theme parks, and music venues, with the DJ market poised “to be massive, huge,” Reeder said. And if all that wasn’t compelling enough to make a splash as the new kid on the block, the ASA system clocks in under $100,000.